If Lafayette can, why can't Louisville? I'm sure the answer is far more complicated than the question. It was over 100°F out in the field but it was a wonderful feeling to be amidst people who care about where their food comes from. It was also calming to stand in the middle of so much new life. Miniature palm tree or kale? I know it's really Monday now but I thought I'd get this out anyway. Your post today inspired me to say this, right here, where anyone can read it. Manisha, you have changed my life. Two years ago if anyone had told me Indian cuisine would be my go-to food, I would have laughed. Yes, I love to cook and experiment, but if I had to choose a favourite it would have been...well, I don't know. Then I met up with Indian cuisine. Oh my. I tried the prepared curry pastes (Thai as well as Indian), and then as spices became more available in my town, I branched out. I searched all over the Internet but the recipes available are often very complex (not to say poorly written out). I found your blog quite by accident (someone linked to your video of Anne Frank,a hero of mine)and--revelation. Clear instructions, recipes that really work, and in the words of Samuel Jonson, it IS "a meal you would ask a man to." Between you and Bong Mom, you've turned our table nicely...even my picky-eater husband likes your foods. And I just found out that down on the coast in Torremolinos, where my husband's lifelong best friend lives, they have opened a "vegetarian supermarket" (his term for an Indian market). My supply of hing and other goodies is assured. Oh bliss. Thank you, Manisha, for teaching us about this joyful way of eating. Thank you for your gorgeous and often mouthwatering pictures, and your slant on life. My thoughts and prayers are with your friend. May she soon fully recover and be able to return home! Isingcakes, so glad you feel the same way! Hugs! anna, you made me cry! In a good way! Thank you! For your kind sweet words. Needless to say, I am overwhelmed and, if you were here, I would have given you a big huge hug. I really hope you are able to find kadipatta (curry leaves) at the new store. 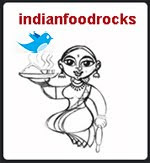 If you don't find any hing, please let me know at indianfoodrocks at gmail dot com and I will share some from my stash. Bong Mom is one of my fave bloggers. She keeps things simple and flavorful, adapting Bengali food to easily available ingredients, without losing the essence of the dish. Nupur, that's exactly why I am dropping everything and heading off to spend an evening at a retro amusement park with my now high-schooler! Lo, thank you! Positive energy and healing thoughts are always appreciated! Loved all those "fresh from the farm"pictures.